The light alcoholic honey beverage can easily be made at home and can be enjoyed year-round. The week of August 14 is marked by Orthodox Christians in Russia with a celebration of “Medoviy Spas” (Saviour of Honey). As per tradition, people gather fresh honey and take it to church to get it blessed. It was believed that nature goes through certain changes in this period. The warmest part of the summer would be over and there would be traces of cold dew on the grass. Honeycombs would be full by then and bee-keepers would cut open the hives to collect the honey. Honey was eaten with bread and various dishes and was used to make non-alcoholic and light alcoholic beverages. 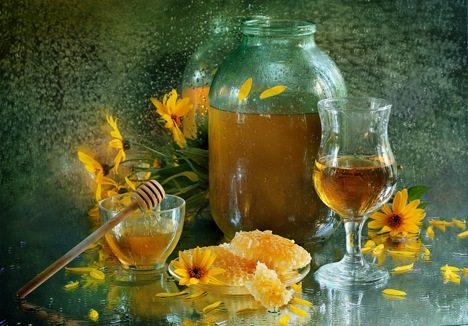 The light alcoholic drink, made from honey, is called in Medovukha in Russian and is similar to European Mead but it is cheaper and faster to make. The words "medovukha" and "mead" are related and go back to the Proto-Indo-European "meddhe" (honey). Known in Eastern Europe since Pagan times, it remained popular well into the 19th century (unlike in Western Europe, where mead is traditionally associated with the Middle Ages). Wild honey farming was one of the first Slavic trades. They discovered that honey could be fermented naturally over 15 to 20 years that made the product very expensive in the beginning and only accessible to the nobility. However, Slavs found that fermentation occurred much faster when the honey mixture was heated, enabling Medovukha to become a folk drink in the territory of Russia. The alcohol content of the drink varies from 2 to 8.5 percent. Nowadays this drink is being mass produced with different level of alcohol and different flavours. Spices to complement the taste of honey include ginger, cinnamon, cloves, chilli and rosemary. The recipe that I will share with you is one of the simplest. The alcohol content is only about 2 percent, which can be increased by adding more honey and waiting for it to get ready for longer time. For example, adding 270 grams of honey for every litre of medovukha will result in alcohol content of about 6-7 percent. I think I must warn you that Medovukha is a drink with unexpected results. When you consume it, it's immediately gets absorbed by blood. Your mind will be sober and clear but legs are "confused." Don't worry this effect will disappear quite quickly. Mix the ingredients and put the mixture in a jar and keep it open for 48 hours. It is advisable to cover the bottle with a cloth to protect from flies and dust. You should see that fermentation has started. If the weather is cool it might take a longer amount of time. After that you need to strain the beverage through the cloth, bottle it and put in the fridge. Usually it takes 2-3 months to make a drink. As result you will get a foamy drink similar to champagne but cloudy. If you keep it for 3-6 months, it won't be so fizzy, but more dense and runny. One trick to find out if the honey is fermented is to light a match and bring it close to the mixture. If the flame doesn't burn strongly, that means the spirit fumes are not there and the fermentation is over. I don't necessarily encourage you to make your own alcoholic drink at home, but I would like to bring to your attention that vodka is not the only Russian alcoholic beverage. There are also other drinks made of natural ingredients like honey and berries that are used to make light, tasty and easily consumed drinks.